(1) New 2014 Topps Update Baseball Hobby Box Factory Sealed. 36 Packs per Box. 10 Cards per Pack. 1 Autograph or Memorabilia Card per Box. 330 cards featuring Veterans, Rookies, 2014 MLB All-Stars, Home Run Derby participants, and Rookie Debuts. There will also be five cards highlighting the top five plays from the first half of the season. Gold Parallel sequentially numbered to 2014. Green Camo Parallel sequentially numbered to 99. Black Parallel sequentially numbered to 63. Pink Parallel sequentially numbered to 50. Platinum Parallel numbered 1/1. Red Hot Foil Parallel inserted 1:6. Clear Parallel Sequentially numbered to 10. STANDARD HOBBY BOX ONLY. Base Card Printing Plates 1,320 printing plates from all of the base cards. HOBBY & JUMBO BOX ONLY. Power Players – Cards featuring the top 25 Power Player performers of the year so far. Fond Farewells – 15 cards saluting some of the most moving and significant retirements of all time. World Series Heroes – 50 cards celebrating some of the most memorable World Series moments and players of all time. The Future is Now – 30 cards featuring the top 10 young players and each of their three best moments in MLB so far. 1989 Topps Minis Die Cut – Mini cards using the 1989 Topps design and die cut around the border and ribbon design. Trajectory Autographs -Over 30 subjects’ career trajectory will be highlighted. Power Players Autographs -15 subjects. Sequentially numbered to 25. Fond Farewells Autographs – 5 subjects. World Series Heroes Autographs – 10 subjects. 1989 Topps Minis Die Cut Autographs – 10 subjects. Sequentially numbered to 10. The Future is Now Autographs – 30 subjects. Strata Signature Relics – It’s back! 25 subjects, signed on-card! Strata Cut Signature – 15 subjects. The Future Is Now Autographed Relics – 30 subjects. Power Players Autographed Relics – 15 subjects. Fond Farewells Autographed Relics – 5 subjects. World Series Strata Signature Relic Card Heroes Autographed Relics – 10 subjects. Power Players Relics – 20 subjects. Sequentially numbered to 99. Fond Farewells Relics – 10 subjects. World Series Heroes Relics – 30 subjects. Own The Name – 500 cards containing letter patches from game-worn MLB jerseys. The Future is Now Relics – 30 subjects. 1989 Mini Die Cut Relics – 15 subjects. Trajectory Jumbo Relics – 40 subjects showing the player’s progression from his rookie season to now. ALL-STAR RELIC AND AUTOGRAPH RELIC CARDS. Featuring relic pieces from the jerseys worn at the 2014 MLB All-Star Game Workout Day! All-Star Stitches Jersey relic cards from at least 60 subjects! All-Star Stitches Gold Parallel – Sequentially numbered to 50. All-Star Stitches Platinum Parallel – Numbered 1/1. All-Star Stitches Autographed Relics – 15 Subjects. All-Star Jumbo Patches – 50 subjects. Sequentially numbered to 6. All-Star Jumbo Patches Autographs – 10 subjects. All-Star Stitches Duals – 10 cards. All-Star Stitches Triples – 10 cards each featuring three All-Stars and a jersey relic piece from each. 1 PER HOBBY CASE. Derek Jeter Reprints – 21 reprints of Derek Jeter’s most famous Topps base cards! These will be framed in black. Silver Framed Derek Jeter Reprints – Sequentially numbered to 25. Gold Framed Derek Jeter Reprints – Sequentially numbered to 10. Gold Framed Topps Gold Label – 15 cards based on the Topps Gold Label design from 2000. These will feature current players as well as retired stars. All cards will be framed in gold. 1 PER JUMBO BOX/1 PER HOBBY CASE. World Series Championship Trophies – Featuring 25 of the greatest players of all time with a specially-designed World Series trophy on a card that celebrates the year they won it all! World Series Rings Silver – Featuring 25 cards of active and retired superstars from title-winning teams with an embedded manufactured World Series ring. World Series Rings Gold – Sequentially numbered to 99. World Series Rings Gold Gems – Sequentially numbered to 25. World Series Rings Gold Gems Autographs – Sequentially numbered to 10. 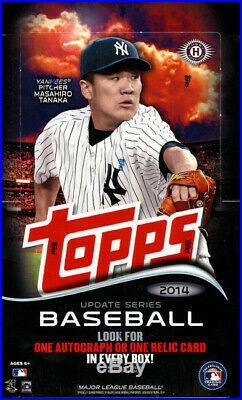 The item “2014 TOPPS UPDATE BASEBALL HOBBY BOX FACTORY SEALED NEW” is in sale since Sunday, April 7, 2019. This item is in the category “Sports Mem, Cards & Fan Shop\Sports Trading Cards\Baseball Cards”. The seller is “paulsmith914″ and is located in Florida, New York. This item can be shipped worldwide.